Giorgio Armani designed every aspect of the 160-room hotel that occupies the concourse to eight floors and levels 38 and 39 in the 160-story, 2625-foot tower. 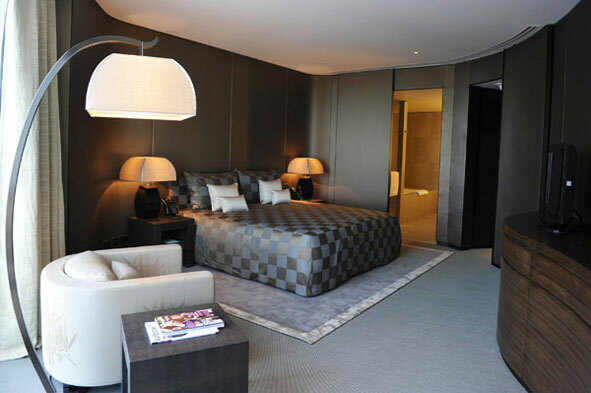 Armani Hotel Dubai, premiered at a ribbon-cutting ceremony on April 27 in the United Arb Emirates city's Burj Khalifa, the world's tallest building. Eight floors and levels 38 and 39 in the 160-story, 2625-foot tower, the 160-room hotel was entirely designed and planned by Armani, featuring custom furnishings, eight restaurant menus, with cuisine that range from Italian to Indian and Japanese and reflect the multi-ethnic money-pot that is Dubai. "It has long been my dream to have a hotel in which I, myself, would like to stay and entertain family and friends, where the Armani aesthetic is combined with Italian-style warmth and hospitality," said Armani at the opening. "I am thrilled to open the doors of the Armani Hotel Dubai and invite my guests in to experience my world." Like his clothes, Armani Hotels are a study in opulent minimalism.